TIME TO END ISLAMIC APPEASEMENT? Islamists have it all over everyone else in the art of intimidation - using freedom in western civilization as a weapon in the battle to rule the world. One reason this practice has been successful is that civilized societies cannot comprehend a doctrine so pervasive in its goal to take over the world that so many non Muslims are unwilling to accept that we are in a war between different worlds. But the threat is not extra-terrestrial; it is a real threat by real people. To dedicated followers of Islam there is but one goal; replace all other religions and governments with Islam and Sharia law. In this, there is no compromise, there are no rules, and everything is allowed to achieve success. We are the victims of our own tolerance and "political correctness." Everywhere we are told that we should not offend anyone with words or deeds while Muslims are not, it seems, limited by the same rules. Curiously, criticism and lampooning the Christian religion is not out of bounds in art or politics but Islam is to be protected by law and custom from such behavior. Disgusting art denigrating Christ and symbols of Chistianity are tolerated but cartoons of Mohammed elicit violence and mayhem without any organized and effective control of such actions. Responsible for this situation, at least in part, is the news media that is filled with misinformation about Islam. Despite untold acts of atrocities by Muslims, Islam is still regarded in many circles as "a religion of Peace"; how absurd is that? In Islamic countries the non-Muslims are treated like second or fifth class people and their populations are decreasing enormously. Countries that had significant numbers of Jews and Christians a century ago now have almost none. There are a handful of Jews left in Iraq. The Copts in Egypt are now only about 8% of Egypt's population. Where did they go? They converted to Islam or went to the West. Political Islam says that we live in "dar al harb", the land of war. Proof that we live in the land of war is found in the refugees from jihad here in America. They are invisible; only a few like Nonie Darwish and Brigitte Gabriel are willing to risk their lives to bring out the truth about Islam and though their audiences are growing they pale in comparison to the numbers still unaware of the threat to freedom Islam poses. No one wants to know the history of Islamic horror. Actions of political Islam by jihad cause terrible suffering for the persecuted. Not only are their families and friends gone, but their cultures are gone too. The tragedy thrust upon these refugees is that no one wants to hear their stories. We must record and publicize their suffering to honor the dead and for use as weapons of war against Islamic imperialism. We must develop all manner of propaganda: film, video and audio to inform the public about what faces the world if we continue to be complacent. Books are also an important tool but we must also have other sources of information such as a system of making films and videos that can implement our strategy of informing about the enemy abroad while confronting the enemy at home. This means that we need to engage in the effort not only through films and videos; we must address the financial culture and reveal the truth about Sharia banking and finance. We must also prepare propaganda [if you can call truth propaganda] that is directed towards the blue collar workers. None of the books written today are of any use for the working classes. Short audio MP3 files can be used by everybody. While we take no or only limited action, political Islam has every single element of their strategy in place at the global, national, state, and local level. Organizations like CAIR (Council on Islamic-American Relations) are active both as lobbyists and plaintiffs in legal actions all over the country where anyone resists providing special treatment for Muslims so that they may continue "to practice their religion" in public institutions like schools, airports, places of employment and everywhere else that does not grant similar concessions to others. There are four ways to discuss Islamic politics to show the world what Islam is really all about: history, current practice, Muslim's personal behavior, and Koran verses and Sharia doctrines. Islamic history of violence and subjugation is almost unknown to many and has been suppressed by our own media and government [the Obama administration has even become its own lexicographer regarding terrorism]. Current knowledge of Islam is only what we see in the newspapers and on TV. This source is largely biased by the media elites who never report the truth about Islam. Judging Islam by Muslim's actions is not accepted by many. Misconceptions of Islam in the modern era can be challenged if people become better informed. Islamic doctrine is precise and is easily learned. The good news is that Islam never deviates from its "playbook" doctrine. Therefore it is easy to understand what they do and what they will do next. We must become bigot-proof because any challenge will invite accusations of racism. Presently Muslims and Muslim practices cannot be criticized but it's not bigoted to say what Mohammed did and to talk about Islamic politics. 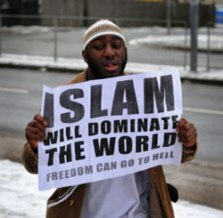 The facts of Islamic doctrine are shocking and repulsive. As long as we discuss doctrine we win. By informing the public when apologists discuss how bad the non-Muslim world is, how bad Christians are, or that they know a "good" Muslim; remind them about Islamic doctrine and Islamic cruelties. In the 1800's America sent its Navy and Marines to fight the Barbary pirates in North Africa. But the Muslims never called their naval raiders "Barbary pirates." They called them ghazis, sacred raiders. Naming them "pirates" showed that we "kafirs" (non Muslims) had no idea about the doctrine and history of Islam. In the news these days the media report on the intifada and label it an uprising by the Palestinians against the Israelis. But the terms intifada, Palestinian, and Israeli are misnomers. If we look at the Koran we see that truer terms are jihad, Muslim and infidel (Jews and Christians are infidels because they are non-Muslims). The doctrine of political Islam clearly states that jihad is to be waged by all Muslims against all Jews and other "kafirs." Today is no different than 1400 years ago in Islam. One writer put it this way: "The events of 9/11 are recorded in the West as an attack by terrorists. Mohammed Atta, the leader of the 9/11 attack, was a pious Muslim. He left a letter clearly stating his intentions: 9/11 was pure jihad. An attack is a single event, but jihad is a 1400-year continuous process. Therefore, a terrorist attack is not the same as jihad. Terrorism does not have the same meaning as jihad." We have been in a war declared by Islam for centuries and have defeated Islam twice before. Today we have tried a strategy of appeasement without changing anything; we have recently tried empty threats and when that did not work we have pretended that if we are nice enough, Islam will be nice. We refuse to believe the doctrine of political Islam. "It just can't be true." We cannot fight a defensive war if we are to defeat Islam. The war must be offensive and fought with the idea of defeating Islam with such totality that, as Ariel Sharon said in his book 'Warriors", we instill in its political leaders a "psychology of defeat such that they come to believe they cannot win." For far too long the West has believed that some form of defensive coexistence can work; it cannot. Such a practice against Islam has never worked during 1400 years and it won't work now. While Islam's power grows daily, our government and others in the western world will not acknowledge there is a war against political Islam; instead we actually aid it through welfare, immigration and civil rights legislation. The time for appeasement is over. Those of us who understand Islam must band together to expose the enemy abroad and attack the enemy at home. It is simple; we either fight or lose our civilization. Continuing denial and pacifism will be the end of our way of life and of freedom.